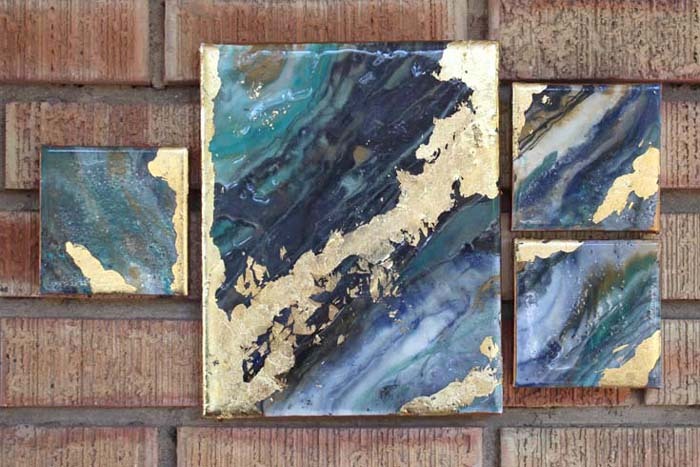 Poured Resin Gold Leaf Canvas Gallery Art! Hey Resin Crafters, it’s Natalie from Doodlecraft again. 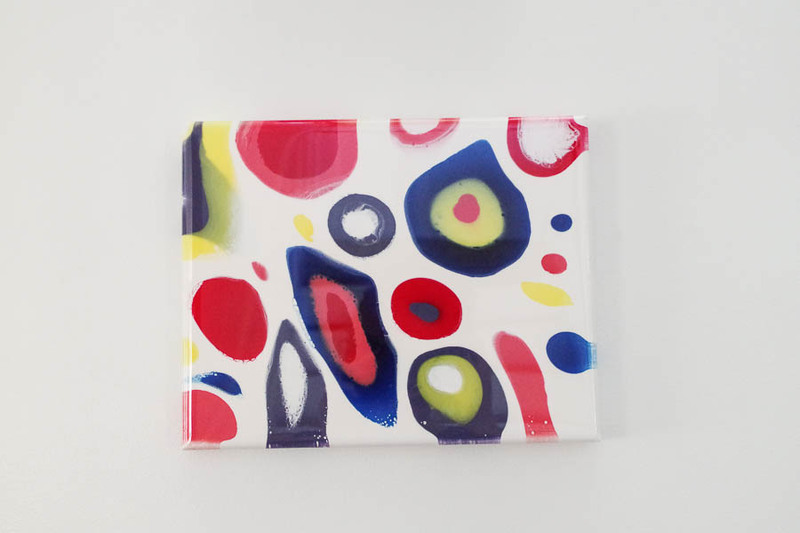 Have you tried poured resin art yet? Poured Resin is so uniquely stunning! 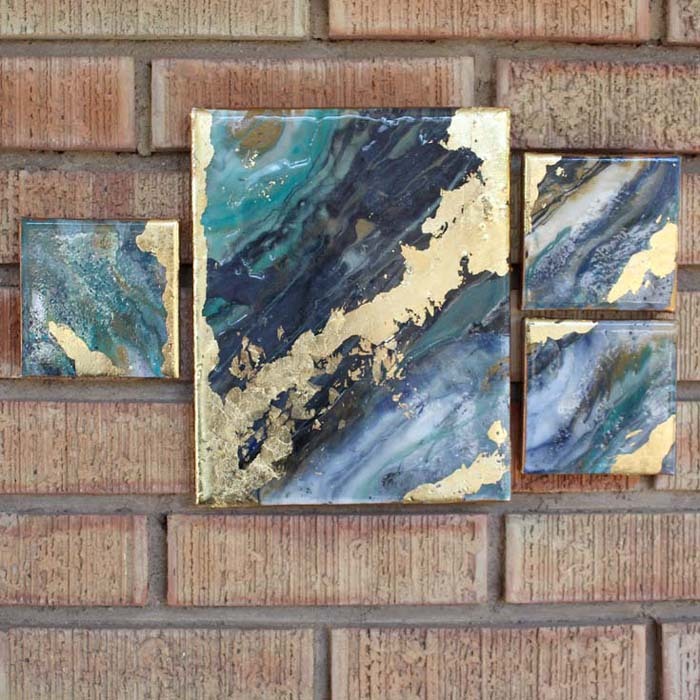 Create works of art that can be hung as a cluster or gallery wall and match all the decor of the home. Begin by covering your work table with a disposable tablecloth or paper. 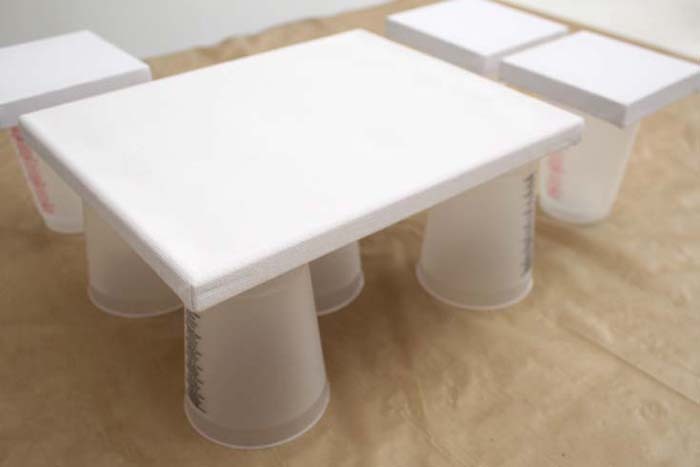 Set cups, cans or some riser-like item on the table and place the canvases on top. Next, mix the High Gloss resin according to the package directions. 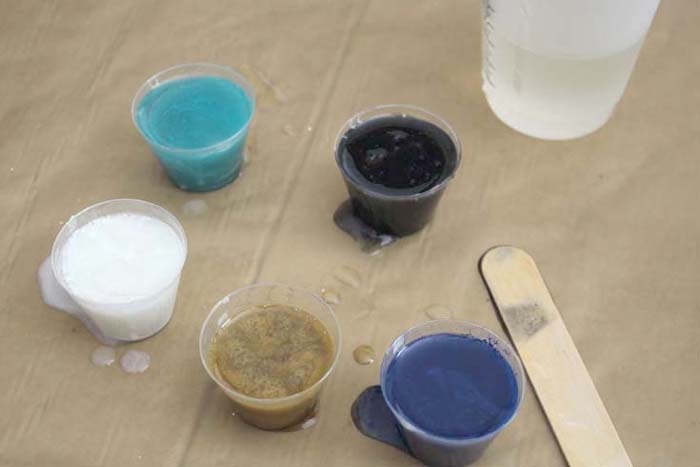 Have your paints ready to add to the resin. 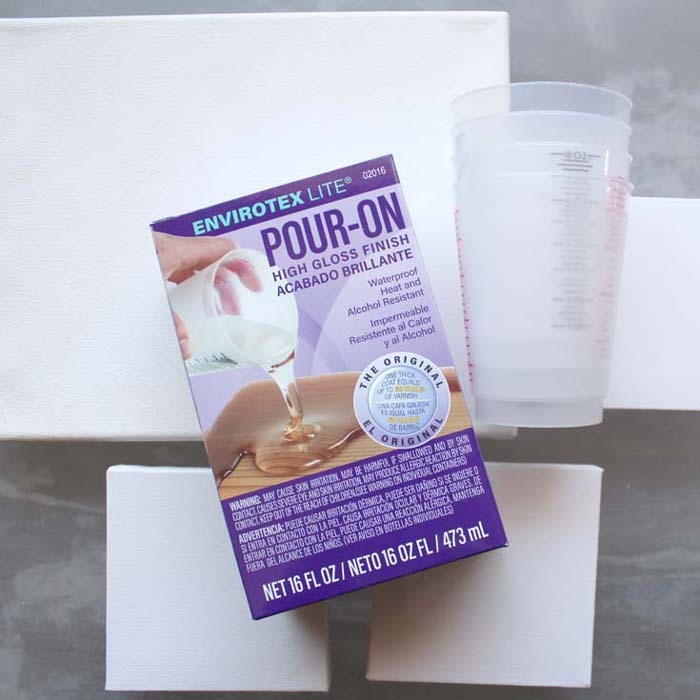 Pour small amount of resin into smaller cups and add a little blob of craft paint. 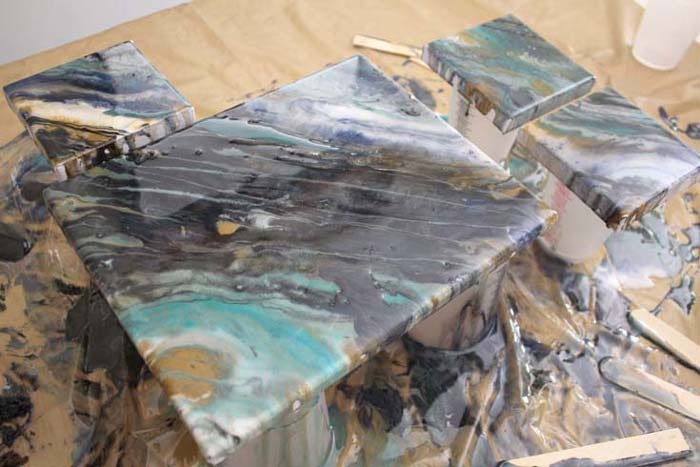 Stir the paint and resin thoroughly. Now the fun part, start pouring colored resin on the canvas. 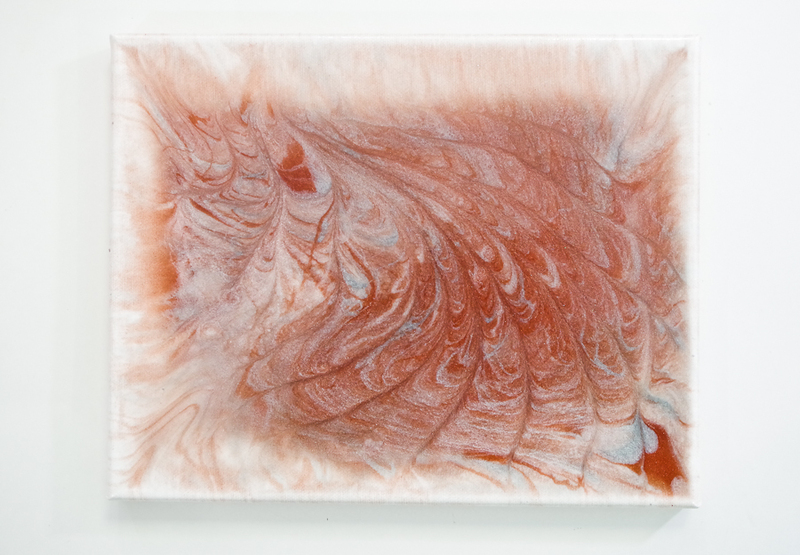 Lift and tilt the canvas to run the resin to the edges, causing the resin colors to swirl. 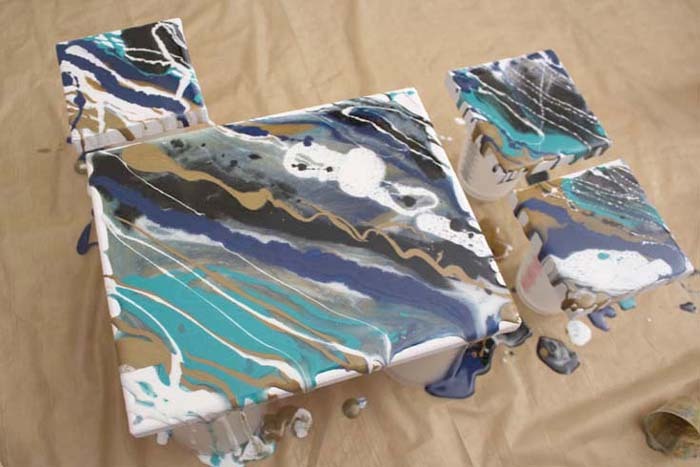 Pour more resin across all the canvases. 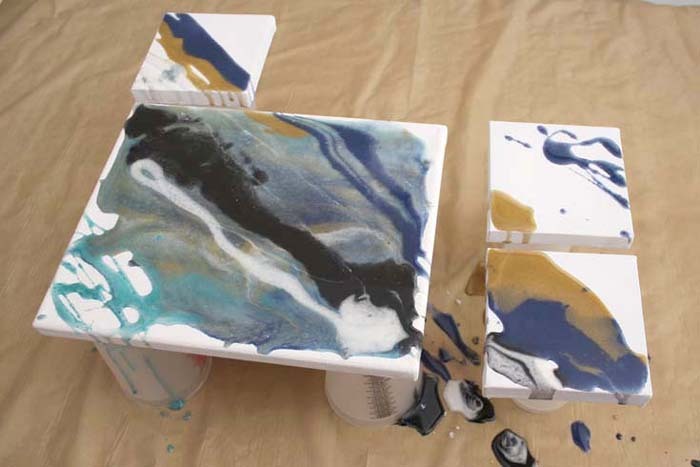 Use a mixing stick to push resin to each edge. Continue adding resin in long stripes, blobs or ribbons. 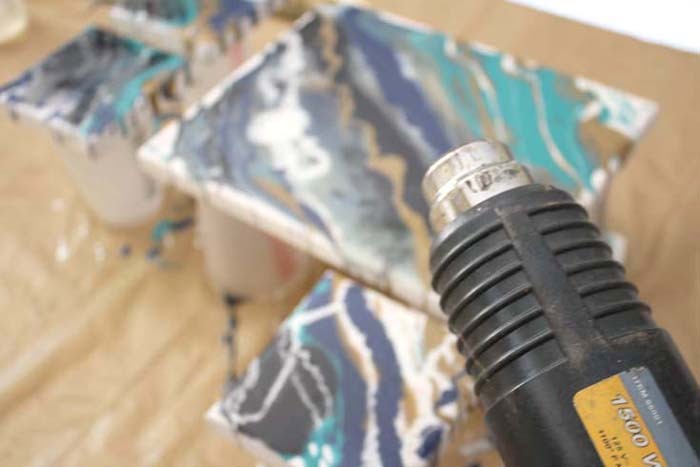 After a layer of resin has been added to the canvas, use the heat gun to warm up the resin and move it around a little. It will pop the bubbles and blow the resin around like a blow dryer. Here’s where the workstation starts to look like a disaster! 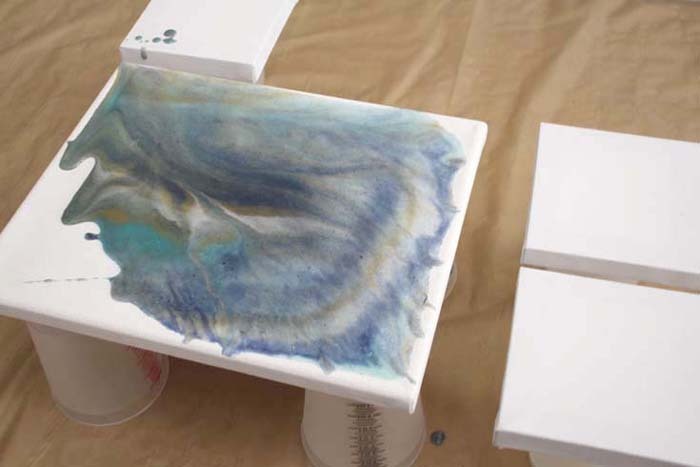 Use mixing sticks to pick up some of the resin on the table and add it to the canvas. Generally the resin should all be in place and ready to set about 20-30 minutes after mixing it. Then let the resin dry and cure overnight. 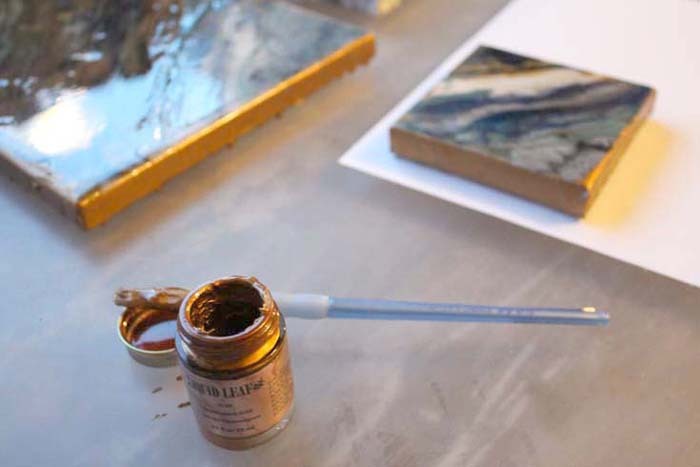 Due to all the resin drips down the edges of the canvas, paint the edges gold with liquid leaf or just paint. 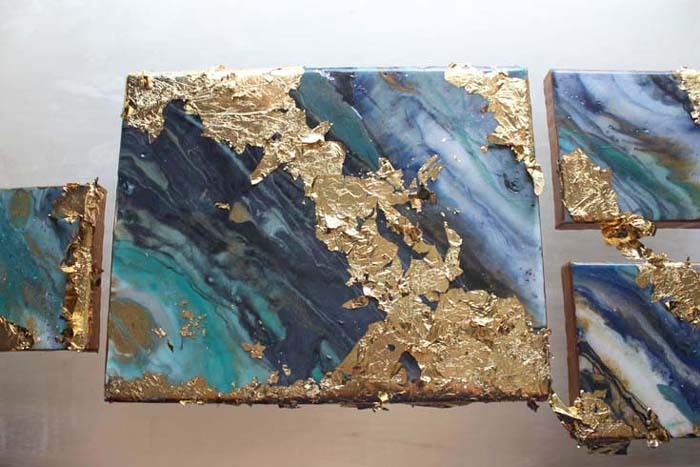 The gloss of the resin is stunning and spectacular, no doubt, but adding some gold leaf is the perfect finishing touch. 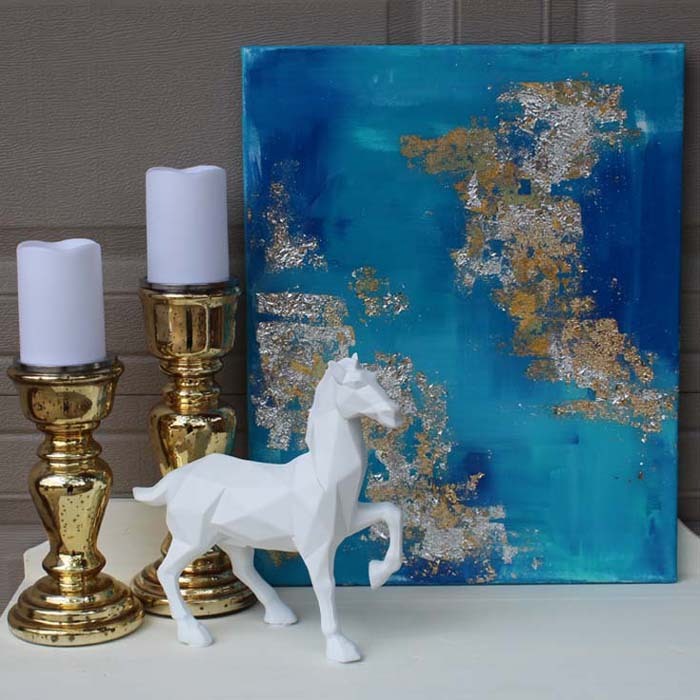 Use a gilding adhesive and paint it on the canvases. 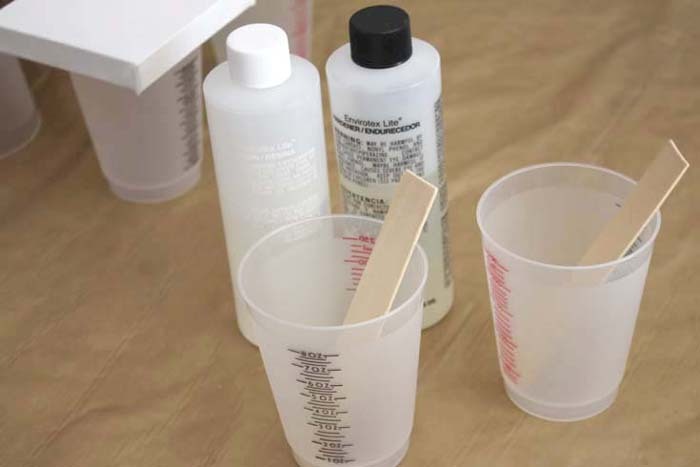 Follow natural resin lines, or use this as a way to cover any imperfections. 😉 We all do it. 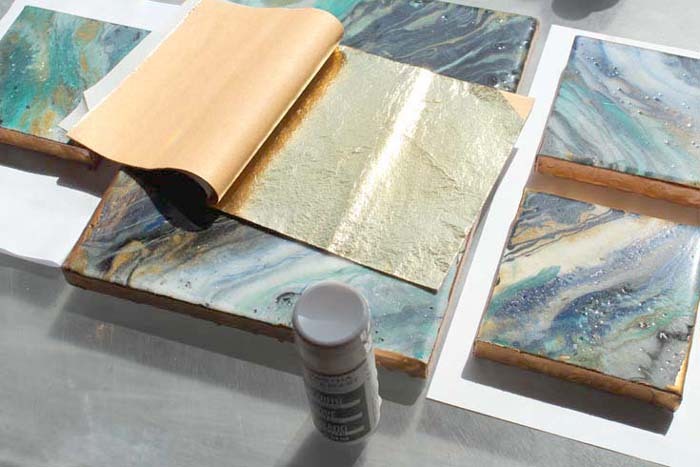 Then place the gold leaf on the glue after it has dried and tacky. Gold leaf is flaky and wonderful. 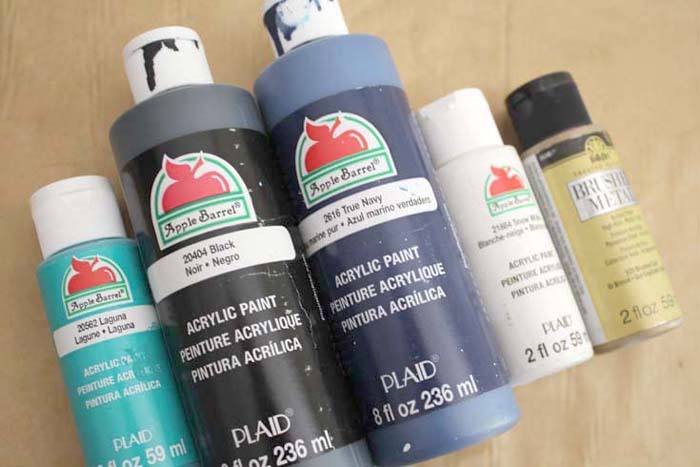 Use a stiff paintbrush to dust off any loose pieces. Finally the canvas is ready to hang on a gallery wall, perfect for a tranquil room in the house. 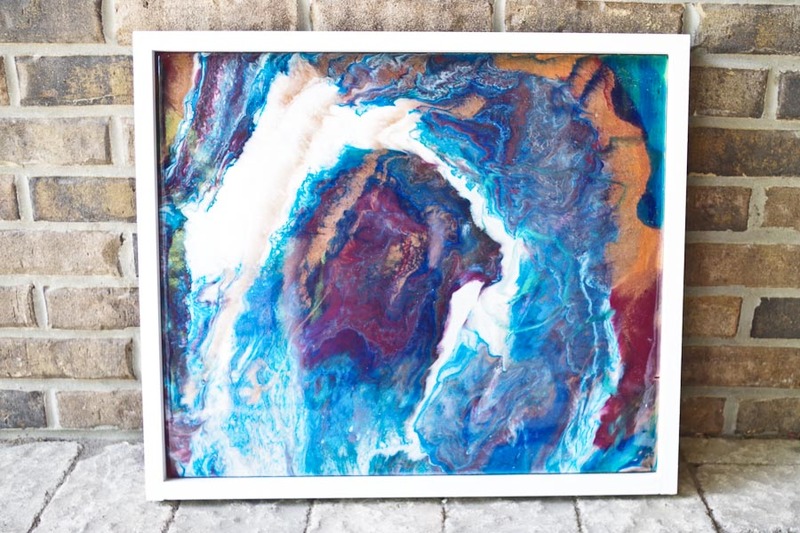 Abstract art is healing and relaxing to create and it creates a story just for the viewer. What colors would you put on your art?